Features IBM ZeroClick technology, which automates the enforcement of records management policies at the technology layer. Invisibly enforces consistent compliance and records management policies. Secures and stores essential company records and supports proof of compliance. Provides prescriptive lifecycle records management without moving content. This reduces the risk of unauthorized changes and helps ensure more trustworthy and reliable information. Provides a consolidated records inventory across repositories to improve auditing, monitoring, searching and transparency. Leverages Java EE technology to help optimize performance. Automates records management tasks to help you enforce compliance, reduce cycle time and minimize errors. Automation helps ensure accurate and consistent records capture and timely disposition of records. It also reduces the risk, labor, time and costs associated with managing records. You can gain additional ROI from reduced storage and discovery costs. Captures records from users and department systems, and helps ensure they are accurately declared, classified and authenticated. Automates the review process and can retain and destroy records according to records and information management policy. 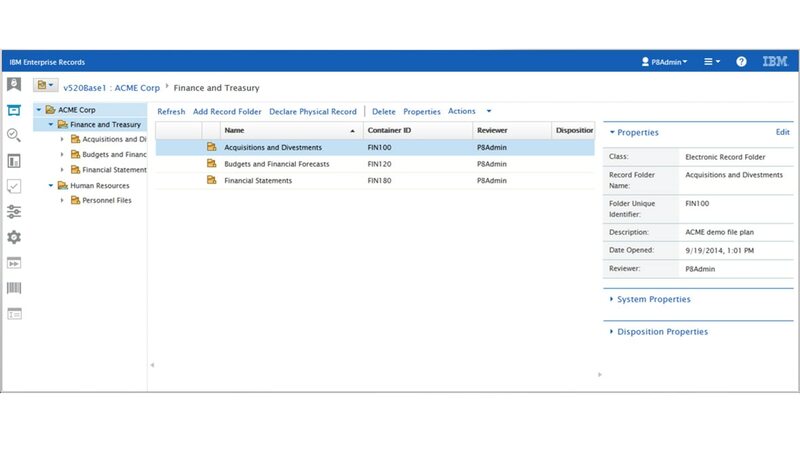 Enables you to manage electronic and physical records, as well as multiple file plans, from a single administration module. Automatically captures email content as records. Reduces the manual steps needed to review vital factors, initiate retention, manage disposition review and approvals, and create file plan folders. The system can track and log all user actions, providing a record of who did what and when. Provides deployment capability on the public cloud through IBM Business Automation Content Services allowing superior scalability, security, stability, mobility across variety of use cases. Also supports deployment over IBM Cloud Private.